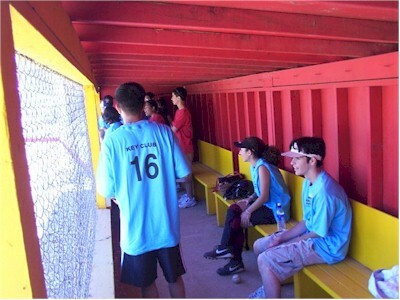 Matt played softball today for the Key Club against a team of adults fom the Kiwanis Club. In the field, ... well, perhaps I should talk about Matt at the plate. He hit the ball hard each time he got up. First time, he pounded a ball into center field and legged out a stand-up double. Later, he hit a sharp single into right field. Finally, he hit one that was caught by the centerfielder. It was fun to watch.